The Billionty-Oneth Geek: WALL-E 15 50 1337!!! ZOMG!!! WALL-E 15 50 1337!!! ZOMG!!! This doesn't require a long review. See this movie. It is great. There is so much charm and heart filled in this 100 minute feature that it can hardly contain itself. Before seeing this movie, I read a few glowing reviews claiming that this was the best Pixar feature to date. I mean I knew it would be at least a decent feature, I don't think Pixar understands how to make a bad movie, but those were weighty statements given that Toy Story, Finding Nemo, and The Incredibles were amongst its successful repetoire. Having seen the movie now, I agree with those critics. As a geek, I should be marking for The Incredibles, which I did love, but Wall-E just had a ton of more heart, if not the same amount of charm and sophistication. If you've seen the trailers, you know the main plot: lonely robot works on Earth, one day meets a new sleek pretty robot, love at first sight occurs, lonely robot travels across the galaxy to reconnect with sleek pretty robot. The plot is simple making it universal and accessible to people of all ages, sizes, and flavours. What made it especially unique was the way it tugged at the heart strings all without the use of dialogue. Wall-E and Eve (the afforementioned sleek pretty robot) hardly communicate with words, but rather with just their eyes and maybe a hum from their motors. Yet we are made to really care for these characters. Adding to the charm of the movie was also the wide array of side characters that Wall-E meets and befriends; mainly three humans and a bunch of "outcast" robots. 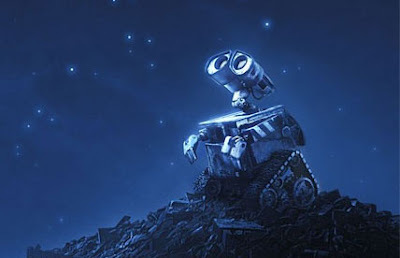 One gets the impression that these so-called "outcasts" weren't really "outcasts" at all, but moreso, curious and adventurous much like their hero, Wall-E. I've read one interesting review (here) that mentions of a parallel in its plot to Christ, which is an interesting claim. It didn't occur to me when I was watching it, but now that I think about it more, it seems quite plausible. Anyhow, I can't recommend this movie enough. This is easily my favourite movie of this year so far. Go see this with loved ones, family, and/or close friends; this is a movie-going experience to share. Ya, that was a great movie - just saw it last night. It's the closest me and sarah have ever been to crying together in a movie theater. WALL-E is indeed 1337.